After more than five amazing years in Glebe it is with mixed emotions that we announce Salerno Gallery will be moving to a new space. Glebe has been absolutely wonderful to us. We’d like to take this opportunity to thank our amazing neighbours and visitors that regularly supported the gallery and exhibiting artists since opening in 2010. It’s sad to end this chapter but we’re also very excited about the future. Further updates about our new space and partners will be made towards the end of 2015 after we take a short break. In the meantime please feel free to keep up to date through our Facebook or Instagram pages. We look forward to seeing all of you again soon! Operating in what is fundamentally a visual industry, Instagram makes sense as a way of communicating via social media. For that reason we’ve been posting images of a range of creative content, including artworks from current and future exhibitions, opening nights, but also artist studio visits and any other art events that we attend and find interesting. Please feel free to follow and engage/share any interesting art related content with us. To find us on Instagram just search #salernogallery or just type in our profile name @salernogallery. Look forward to hearing from you! Wow, it’s an understatement to say it has been a little while since out last blog post. The truth is 2013 has been the busiest year we’ve had since opening in 2010. Conducting back to back exhibitions (over 15 this year so far) doesn’t leave time for much else. On the plus side we’ve had the pleasure of showcasing some amazing work from a range of extremely talented artists. Make sure you keep an eye out on our exhibition page or even our facebook page to keep up to date with what’s coming up next. We’re not the only busy ones this year. Exhibiting artist Jason Christopher recently collaborated with Ken Thaiday for his retrospective exhibition to create a striking piece entitle Clamshell with Hammerhead Shark. Together they have produced the first automated dance artefact which is now permanently housed at Cairns Regional Gallery. 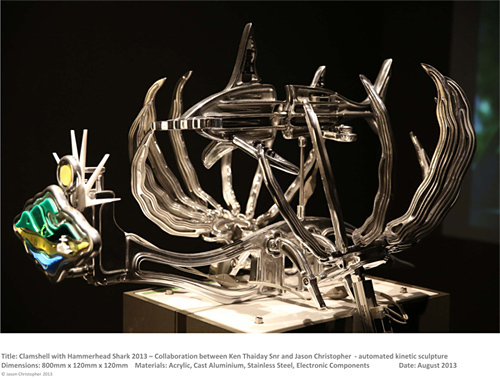 “The end-point of this elaboration is reached in a new work specially commissioned for the retrospective, a collaborative piece made in concert by Thaiday and Sydney artist Jason Christopher: a shark and clamshell assemblage, aluminium, automated, a sculpture that takes on life and movement at a button’s touch. Below is an image of Clamshell with Hammerhead Shark. A video will follow shortly that demonstrates it’s automated features. Salerno Gallery would like to wish you and your family all the best for this festive season! Thank you so much for your support throughout 2012, it has been a terrific year. We will be closed until late January, so keep an eye out for our new exhibition program announced shortly. We look forward to seeing you again soon in 2013! Over the last couple of months Salerno Gallery has been privileged to showcase amazing figurative art work by a variety of talented artists. From Sal Higgens‘ strong, expressive raw forms, to Hank Spirek‘s beautifully textual and vibrant portraits, each artist’s work has offered a unique insight into the exploration of humanity and the society we live in. After the completion of Hank Spirek’s “On the Face of it and other body parts” solo show currently running until the 24th of November, we move to Hendrik Gericke‘s new exhibition entitled “Humourless Tumours“. Hendrik draws upon his South African upbringing to look at themes such as social hierarchy, conflict, migration and culture through his organic surreal cloud-like forms. Tumours promo. from Hendrik Gericke on Vimeo. Now accepting 2013 exhibition proposals! Salerno Gallery is currently accepting proposals from artists and curators for our 2013 exhibition program. We encourage exhibitions showcasing all contemporary visual practices, particularly where the artist responds to a figurative element through their own unique and creative medium. Our ground floor street front exhibition space is light and airy with three large windows facing the always vibrant and active Glebe Point Road. It features over 65m2 of floor space, versatile hanging/display options, track lighting and 24 hour street exposure. Walls are white painted concrete and the floor has a neutral concrete surface. A selection of plinths are available upon request. For an information pack please feel free to contact us. To download an application form please visit our hire space page.As always, feel free to join our mailing list or Facebook page and be kept up to date with future news and events. New Tracks is an collaborative exhibition that will create a visual framework for the mapping of intersecting life stories. Co-ordinating artists Annette Simpson and Jack Randell invite you to be part of the creation of collaborative 2D works culminating in an exhibition running at Salerno Gallery from 10 – 23 September 2012. New Tracks is an engagement process. The pictures in this exhibition embody collective identity, of experience and place. Collaboratively we will have created a representation of place that individually could never have been produced. It is free to participate and works can be created in any medium. If you have never participated in a collaborative art process before, this is a terrific opportunity to get involved! Hello everyone. Hope you all had a terrific festive season! Salerno Gallery has been very busy over the end of year break planning an exciting year of exhibitions and events for 2012. We will be kicking off the year with a group exhibition of photographic works entitled “On Film”. As the title suggests, the exhibition showcases the unique properties of analogue film photography through the personal perspectives of four separate photographers. Each individual journey demonstrates a different aesthetic and subject matter, combining to illustrate a broad spectrum of analogue photographic processes from traditional handmade Bromoil prints to modern slide film photography. The exhibition opens on the 24th of January and runs until the 11th of February. For more information and images visit the On Film exhibition page. We look forward to seeing you all throughout 2012!